‘I would like to make a kind of sensational declaration and to admit openly that I am an agent and member of the ‘fifth column’, announced a doctor of social sciences, Rafael Muksinov, the author of a book entitled ‘Czym jest nasze życie?…’ (in English, the title literally means ‘What our life is?…’). The presentation of the book took place in the office of authorities of the Vilnius region. After a short pause, Muksinov added: ‘I am not the agent of Moscow, as some people try to imply, but of the European Union and Brussels, where the highest standards of democracy and rights for ethnic minorities are met’. The author said that it is the third book written by him. The book contains articles, essays, prelections, interviews and speeches delivered during national and international meetings over the last twenty years. In his book, Muksinov focuses mainly on the policy of the Lithuanian government towards ethnic minorities. He regrets that this policy is not aimed at integration, but assimilation of ethnic minorities, especially Poles and Russians. The education policy and general disregard of European standards in the field of rights of ethnic minorities prove such a tendency in the policy of the Lithuanian government. ‘Nowadays, Polish and Russian schools, in fact, are not Polish or Russian ones, but Lithuanian schools with a limited option of education conducted in a native language’, claimed Muksinov, who is an expert on this topic, because he’s worked for many years as a psychologist and teacher in Polish and Russian schools in Vilnius. According to the author, another disturbing fact is that the Lithuanian elite fixed their phobias and prejudices towards ethnic minorities which made a significant contribution to Lithuanian culture, enhancing it over centuries. ‘Twenty-five years after Lithuania regained its independence, Lithuanians do not trust ethnic minorities, which are regarded even as ‘a foreign object’ in a body. After all, the representatives of ethnic minorities are loyal citizens, and we should not be afraid of them. Moreover, we should expand the range of their rights in accordance with standards set by the European Union, as Lithuania is its member’, stated the social activist and researcher, well-known not only in Lithuania. According to Muksinov, Lithuanian should not postpone the adoption of the Act on ethnic minorities and the perfect solution would be also to guarantee ethnic minorities proportional participation in local and national authorities. Muksinov claimed that the only possible reaction to discriminatory steps taken by Lithuanian government is the union of ethnic minorities and defence of their rights, achieved, for example, by active participation in elections. He also stated that Russians in Lithuania are divided, not active, and instead of two Russian political parties one would be enough. Moreover, according to Muksinov, the perfect solution would be to establish one party of ethnic minorities under the leadership of Waldemar Tomaszewski, a eurodeputy. ‘Tomaszewski is a brave man of firm beliefs, great faith, but he is also a modest altruist, who has been committed to provide well-being for all citizens of our country’, emphasized Muskinov. 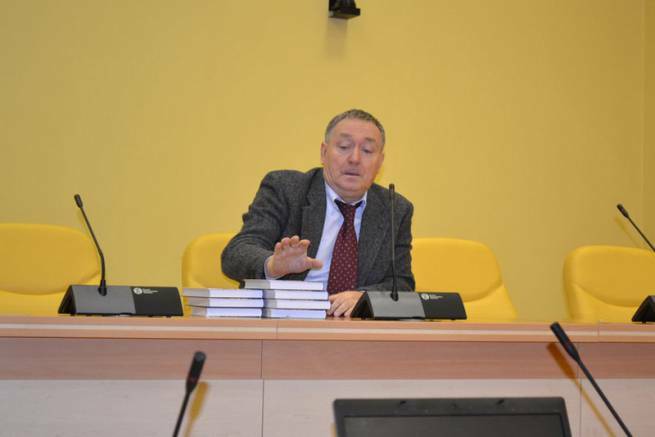 The eurodeputy, Waldemar Tomaszewski, admitted that he has known the author for a long time and he appreciates his courage, honesty, intransigence, faithfulness to his ideals, and that is why Tomaszewski decided to write a prologue to Muksinov’s book. ‘The most important issue is that Mr Muksinov is a man, we can rely on, and that is why he has been put on the list of our candidates in municipal elections and he will run for a seat in the Council of Vilnius’, announced Tomaszewki, who has been the leader of Electoral Action of Poles in Lithuania for 15 years. He also declared that his aim – both in private and political life – is to unite, not divide people. ‘Thanks to God’s Providence and our diligent activity, our party gains more and more supporters, which is a good sign before the approaching municipal elections’, enjoys Waldemar Tomaszewski. People who appeared at the presentation asked the author many questions. Mr Muksinov replied to them in a very thorough way. One of the questions referred to the potential translation of the book into Lithuanian. The autor said that there was an interest in this matter and he did not rule out that the book would be published also in Lithuanian.